Since SB 2135 was enacted on June 1, 2009, below are the Texans who have died while in service to their country. Ogden, Matthew D., Corpus Christi, Texas, Private First Class, U.S. Army – died June 1, 2009, of wounds suffered when an improvised explosive device detonated near his vehicle, Nerkh, Afghanistan. He was assigned to the 2nd Battalion, 87th Infantry Regiment, 3rd Brigade Combat Team, 10th Mountain Division (Light Infantry) Fort Drum, New York. The Cemetery flew the Memorial Flag at half-staff in Lt. Andrews honor on November 16, 2009. Soto, Joshua W., San Angelo, Texas, Sergeant, U. S. Army – died June 16, 2009, of wounds when an improvised explosive device detonated near his vehicle, Iraq. He was assigned to the 1st Battalion, 77th Armor Regiment, 4th Brigade Combat Team, 1st Armored Division, Fort Bliss, Texas. The Cemetery flew the Memorial Flag at half-staff in Sergeant Soto’s honor on November 17, 2009. Hazlewood, Joshua L., Manvel, Texas, Specialist, U. S. Army – died June 25, 2009, of wounds sustained from non-combat related incident, Arifjan, Kuwait. He was assigned to the 614th Automated Cargo Documentation Detachment. The Cemetery flew the Memorial Flag at half-staff in Specialist Hazlewood’s honor on November 18, 2009. Cross, Peter, K., Saginaw, Texas, Private First Class, U.S. Army – died on June 26, 2009, of injuires sustained during a vehicle roll-over at Combat Outpost Carwile, Afghanistan. He was assigned to the 2nd Battalion, 87th Infantry Regiment, 3rd Brigade Combat Team, 10th Mountain Division (Light Infantry), Fort Drum, New York. The Cemetery flew the Memorial Flag at half-staff in Private First Class Cross’s honor on November 19, 2009. Tate, Darren Ethan, Canyon, Texas, Aviation Ordnanceman Airman, U.S. Navy – died July 8, 2009, of non-hostile causes, Bagram Air Base, Afghanistan. He was assigned to the U.S.S. Iwo Jima and deployed as an Individual Augmentee to Combined Security Transition Command – Afghanistan. The Cemetery flew the Memorial Flag at half-staff in Aviation Ordnanceman Airman Tate’s honor on November 20, 2009. Farris, Joshua R., La Grange, Texas, Specialist, U.S. Army – died July 9, 2009, of wounds suffered when an improvised explosive device detonated near his vehicle, Wardak Province, Afghanistan. He was assigned to 2nd Battalion, 87th Infantry Regiment, 3rd Brigade Combat Tea, 10th Mountain Division (Light Infantry), Fort Drum, New York. The Cemetery flew the Memorial Flag at half-staff in Specialist Farris’s honor on November 23, 2009. Lara, Brandon T., New Braunfels, Texas, Lance Corporal, U.S. Marine Corps – died July 19, 2009, while supporting combat operations, Anbar Province, Iraq. He was assigned to 3rd Battalion, 4th Marine Regiment, 1st marine Division, I Marine Expeditionary Force, Camp Pendleton, California. The Cemetery flew the Memorial Flag at half-staff in Lance Corporal Lara’s honor on November 24, 2009. Owens, Gregory, Jr., Garland, Texas, Sergeant, U.S. Army – died July 20, 2009, of wounds suffered when an improvised explosive device detonated near his vehicle followed by an attack from enemy forces using small arms and rocket-propelled grenade fires, Wardak Province, Afghanistan. He was assigned to the 4th Battalion, 25th Field Artillery (STRIKE), 3rd Brigade Combat Team, 10th Mountain Division (Light Infantry), Fort Drum, New York. The Cemetery flew the Memorial Flag at half –staff in Sergeant Owens’s honor on November 25, 2009. Roughton, Andrew J., Houston, Texas, Specialist, U.S. Army – died July 20, 2009, of wounds suffered when an improvised explosive device detonated near his vehicle followed by an attack from enemy forces using small arms and rocket-propelled grenade fires, Wardak Province, Afghanistan. He was assigned to the 4th Battalion, 25th Field Artillery (STRIKE), 3rd Brigade Combat Team, 10th Mountain Division (Light Infantry), Fort Drum, New York. The Cemetery flew the Memorial Flag at half-staff in Specialist Roughton’s honor on November 30, 2009. Babine, Travis T., San Antonio, Texas, Lance Corporal, U.S. Marine Corps – died August 6, 2009, while supporting combat operations, Farah Province, Afghanistan. He was assigned to the 2nd Battalion, 3rd Marine Regiment, 3rd Marine Division, III Marine Expeditionary Force, based out of Marine Corps Base Hawaii, Kaneohe Bay. The Cemetery flew the Memorial Flag at half-staff in Lance Corporal Babine’s honor on December 1, 2009. Hoskins, Jay M., Paris, Texas, Sergeant, U. S. Marine Corps – died August 6, 2009, while supporting combat operations, Farah Province, Afghanistan. He was assigned to the 2nd Battalion, 3rd marine Regiment, 3rd Marine Division, III Marine Expeditionary Force, based out of Marine Corps Base Hawaii, Kaneohe Bay. The Cemetery flew the Memorial Flag at half-staff in Sergeant Hoskins’s honor on December 2, 2009. Bowen, Clayton P., San Antonio, Texas, Staff Sergeant, U.S. Army – died August 18, 2009, of wounds suffered when an improvised explosive device detonated near his vehicle, Paktika, Afghanistan. He was assigned to the 1st Battalion, 501st parachute Infantry Regiment, 4th Airborrne Brigade Combat Team, 25th Infantry Division, Fort Richardson, Alaska. The Cemetery flew the Memorial Flag at half-staff in Staff Sergeant Bowen’s honor on December 3, 2009. Baltazar, Christopher S., San Antonio, Texas, Lance Corporal, U.S. Marine Corps – died September 3, 2009, while supporting combat operation, Helmand Province, Afghanistan. He was assigned to 2nd Light Armored Reconnaissance Battalion, 2nd Marine Division, II Marine Expeditionary Force, Camp Lejeune, North Carolina. The Cemetery flew the Memorial Flag at half-staff in Lance Corporal Baltazar’s honor on December 4, 2009. Andrews, Darryn D., Dallas, Texas, 2nd Lt., U.S. Army – died September 4, 2009, of wounds suffered when enemy forces attacked his vehicle with an improvised explosive device and a rocket-propelled grenade, Paktia Province, Afghanistan. He was assigned to 1st Battalion, 501st Parachute Infantry Regiment, 4th Brigade Combat Team (Airborne), 25th Infantry Division, Fort Richardson, Alaska. The Cemetery flew the Memorial Flag at half-staff in Lt. Andrews’s honor on December 7, 2009. Meadows, Joshua S., Bastrop, Texas, Captain, U.S. Marine Corps – died September 5, 2009, while supporting combat operations, Farah Province, Afghanistan. He was assigned to 1st Marine Special Operations Battalion, Marine Corps Forces Special Operations Command, Camp Pendleton, California. The Cemetery flew the Memorial Flag at half-staff in Captain Meadows’s honor on December 8, 2009. Murphrey, Michael C., Snyder, Texas, Staff Sergeant, U.S. Army – died September 6, 2009, of wounds suffered when enemy forces attacked his unit with an improvised explosive device, Paktika Province, Afghanistan. He was assigned to 1st Battalion, 501st parachute Infantry Regiment, 4th Brigade Combat Team (Airborne), 25th Infantry Division, Fort Richardson, Alaska. The Cemetery flew the Memorial Flag at half-staff in Staff Sergeant Murphrey’s honor on December 9, 2009. Mills, Joshua M., El Paso, Texas, Staff Sergeant, U.S. Army – died September 16, 2009, of wounds suffered when enemy forces attacked his vehicle with an improvised explosive device, Helmand Province, Afghanistan. He was assigned to 3rd Battalion, 7th Special Forces Group, Fort Bragg, North Carolina. The Cemetery flew the Memorial Flag at half-staff in Staff Sergeant Mills’s honor on December 10, 2009. Davis, David A., Dalhart, Texas, Sergeant, U.S. Army – died September 19, 2009, of wounds suffered when enemy forces attacked using indirect fire, Bagram Airfield, Afghanistan. He was assigned to the 32nd Transportation Company, 68th Combat Sustainment Support Battalion, 43rd Sustainment Brigade, 4th Infantry Division, Fort Carson, Colorado. The Cemetery flew the Memorial Flag at half-staff in Sergeant Davis’s honor on December 11, 2009. Courtois, Matthew R., Lucas, Texas, Senior Airman, U.S. Air Force – died September 20, 2009, as a result of a non-hostile incident, Abdullah Al Mubarak Airbase, Kuwait. He was assigned to the 366th Security Forces Squadron, Mountain Home Air Force Base, Idaho. The Cemetery flew the Memorial Flag half-staff in Senior Airman Courtois’s honor on December 14, 2009. Staats, Chris N., Fredericksburg, Texas, Staff Sergeant, U.S. Army – died October 16, 2009, of wounds suffered when enemy forces attacked his vehicle with an improvised explosive device, Wardak Province, Afghanistan. He was assigned to 143rd Infantry Detachment, Austin, Texas. The Cemetery flew the Memorial Flag at half-staff in Staff Sergeant Staats’s honor on December 15, 2009. Espinoza, Bradley, Mission, Texas, Staff Sergeant, U.S. Army – died October 19, 2009, of wounds suffered when enemy forces attacked his vehicle with an improvised explosive device, Qwest, Iraq. He was assigned to 1st Battalion, 12th Cavalry Regiment, 3rd Brigade Combat Team, 1st Cavalry Division, Fort Hood, Texas. The Cemetery flew the Memorial flag at half-staff in Staff Sergeant Espinoza’s honor on December 16, 2009. McNabb, Shawn H., Terrell, Texas, Staff Sergeant, U.S. Army – died October 26, 2009, of wounds suffered when the MH-47 helicopter he was aboard crashed, Darreh-ye Bum, Afghanistan. He was assigned to the 3rd Battalion, 160th Special Operations Regiment (Airborne), Hunter Airfield, Georgia. The Cemetery flew the Memorial Flag at half-staff in Staff Sergeant McNabb’s honor on December 17, 2009. Delarosa, Fernando, Alamo, Texas, Sergeant, U.S. Army – died October 27, 2009, of wounds when enemy forces attacked his vehicle with an improvised explosive device, Arghandab Valley, Afghanistan. He was assigned to 1st Battalion, 17th Infantry Regiment, 5th Stryker Brigade Combat Team, 2nd Infantry Division, Fort Lewis, Washington. The Cemetery flew the Memorial Flag at half-staff in Sergeant Delarosa’s honor on December 18, 2009. Stanley, Cody R., Rosanky, Texas, Lance Corporal, U.S. Marine Corps – died October 28, 2009, while supporting combat operations, Helmand Province, Afghanistan. He was assigned to 3rd Battalion, 4th Marine Regiment, 1st Marine Division, I Marine Expeditionary Force, Marine Corps Air Ground Combat Center, Twentynine Palms, California. The Cemetery flew the Memorial Flag at half-staff in Lance Corporal Stanley’s honor on December 21, 2009. Ruiz, Cesar B., San Antonio, Texas, Sergeant, U.S. Marine Forces Reserve – died October 31, 2009, while supporting combat operations in Helmand Province, Afghanistan. He was assigned to Marine Forces Reserve, New Orleans. The Cemetery flew the Memorial Flag at half-staff in Sergeant Ruiz’s honor on December 22, 2009. Hefner, Shawn P., Hico, Texas, Lance Corporal, U.S. Marine Corps – died November 13, 2009, while supporting combat operations in Helmand Province, Afghanistan. He was assigned to 2nd Amphibious Assault battalion, 2nd Marine Division, II Marine Expeditionary Force, Camp Lejeune, North Carolina. The Cemetery flew the Memorial Flag at half-staff in Lance Corporal Hefner’s honor on December 23, 2009. Lewis, Joseph M., Terrell, Texas, Specialist, U.S. Army – died November 17, 2009, of wounds suffered when enemy forces attacked his vehicle with an improvised explosive device in Kandahar, Afghanistan. He was assigned to the 8th Squadron, 1st Cavalry Regiment, 5th Stryker Brigade Combat Team, 2nd Infantry Division, Fort Lewis, Washington. The Cemetery flew the Memorial Flag at half-staff in Specialist Lewis’s honor on December 24, 2009. Juarez, Mark D., San Antonio, Texas, Lance Corporal, U.S. Marine Corps – died January 9, 2010, of wounds while supporting combat operations in Helmand Province, Afghanistan. He was assigned to 1st Battalion, 3rd Marine Regiment, 3rd Marine Division, III Marine Expeditionary Force, Kaneohe Bay, Hawaii. The Cemetery flew the Memorial Flag at half-staff in Lance Corporal Juarez’s honor on January 18, 2010. Uzenski, Nicholas K., Tomball, Texas, Corporal, U.S. Marine Corps – died January 11, 2010, of wounds suffered while supporting combat operations in Helmand, Province, Afghanistan. He was assigned to 3rd Reconnaissance Battalion, 3rd Marine Division, III Marine Expeditionary Force, Okinawa, Japan. The Cemetery flew the Memorial Flag at half-staff in Corporal Uzenski’s honor on January 19, 2010. Pena, Paul, San Marcos, Texas, Captain, U.S. Army – died January 19, 2010, of wounds suffered when enemy forces attacked his unit with an improvised explosive device in Arghandab River Valley, Afghanistan. He was assigned to the 2nd Battalion, 508th Parachute Infantry Regiment, 4th Brigade Combat Team, 82nd Airborne Division, Fort Bragg, North Carolina. 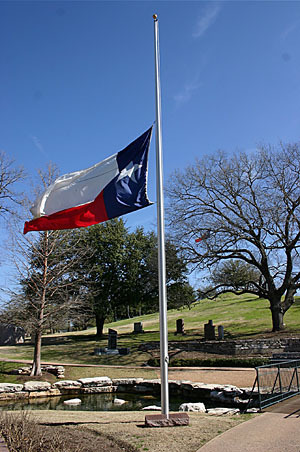 The Cemetery flew the Memorial Flag at half-staff in Captain Pena’s honor on January 26, 2009. Alvarez, Adriana, San Benito, Texas, Private First Class, U.S. Army – died February 10, 2010, of injuries sustained while supporting combat operations in Baghdad, Iraq. She was assigned to the 504th Military Police Battalion, 42nd Military Police Brigade, Joint Bae Lewis-McChord, Washington. The Cemetery flew the Memorial Flag at half-staff in Private First Class Alvarez’s honor on February 21, 2010. Caughman, Sean L., Fort Worth, Texas, Petty Officer 1st Class, U.S. Navy – died February 16, 2010, while supporting operations in Kuwait. He was assigned to Naval Mobile Construction Battalion Twenty-Two. The Cemetery flew the Memorial Flag at half-staff in Petty Officer 1st Class Caughman’s honor on February 24, 2010. Wood, Zarian, Houston, Texas, Petty Officer, United States Navy – died May 16, 2010, of wounds sustained from an improvised explosive device blast while on dismounted patrol in Helmand Province, Afghanistan. He was assigned as a hospital corpsman to Third Battalion, First Marine Regiment, First Marine Division, I Marine Expeditionary Force. The Cemetery flew the Memorial Flag at Half-staff in Petty Officer Wood’s honor on May 21, 2010. Pagan, Bobby J., Austin, Texas , Specialist, U.S. Army – died February 13, 2010, of wounds suffered when enemy forces attacked his unit with an improvised explosive device in Zhari Province, Afghanistan. He was assigned to the 1st Battalion, 12 Infantry Regiment, 4th Brigade Combat Team, 4th Infantry Division, Fort Carson, Colorado. The Cemetery flew the Memorial Flag at half-staff in Specialist Pagan’s honor on February 25, 2010. Gamble, Garrett W., Sugarland, Texas, Lance Corporal, U.S. Marine Corps – died March 11, 2010, while supporting combat operations Helmand Province, Afghanistan. He was assigned to 2nd Battalion, 2nd Marine Regiment, 2nd Marine Division, II Marine Expeditionary Force, Camp Lejeune, North Carolina. The Cemetery flew the Memorial Flag at half-staff in Lance Corporal Gamble’s honor on March 19, 2010. Jordan, Richard J., Tyler, Texas, Staff Sergeant, United States Army – died March 16, 2010, of injuries sustained during a vehicle roll-over in Mosul, Iraq. He was assigned to the 1st Battalion, 36th Infantry Regiment, 1st Brigade Combat Team, 1st Armored Division, Fort Bliss, Texas. The Cemetery flew the Memorial Flag at half-staff in Staff Sergeant Jordan’s honor on March 24, 2010. Gonzales, Esau S. A., Staff Sergeant, United States Army – died May 3, 2010, of injuries sustained in Mosul, Iraq. He was assigned to the 38th Explosive Ordnance Disposal Company, Fort Stewart, Georgia. The Cemetery flew the Memorial Flag at half-staff in Staff Sergeant Gonzales’s honor on May 13, 2010. Rangel, Christopher, San Antonio, Texas, Lance Corporal, United States Marine Corps – died May 6, 2010, while supporting combat operations in Helmand Province, Afghanistan. He was assigned to the 3rd Battalion, 6th Marine Regiment, 2nd Marine Division, II Marine Expeditionary Force, Camp Lejeune, North Carolina. The Cemetery flew the Memorial Flag at half-staff in Lance Corporal Rangel’s honor on May 14, 2010. Johnson, Jeffrey W., Tomball, Texas, Corporal, United States Marine Corps – died May 11, 2010, while supporting combat operations in Helmand Province, Afghanistan. He was assigned to 3rd Battalion, 1st Marine Regiment, 1st Marine Division, I Marine Expeditionary Force, Camp Pendlton, California. The Cemetery flew the Memorial Flag at half-staff in Corporal Johnson’s honor on May 18, 2010. May, Kenneth B. , Kilgore, Texas, Sergeant, United States Marine Corps – died May 11, 2010, while supporting combat operations in Helmand Province, Afghanistan. He was assigned to 3rd Battalion, 1st marine Regiment, 1st Marine Division, I Marine Expeditionary Force, Camp Pendleton, California. The Cemetery flew the Memorial Flag at half-staff in Sergeant May’s honor on May 19, 2010. Leicht, Jacob C., College Station, Texas, Corporal, United States Marine Corps – died May 27, 2010, while supporting combat operations in Helmand province, Afghanistan. He was assigned to the 1st Light Armored Reconnaissance Battalion, 1st Marine Division, 1st Marine Expeditionary Force, Camp Pendleton, California. The Cemetery flew the Memorial Flag at half-staff in Corporal Leicht’s honor on June 7, 2010. Bury, Brandon C., Kingwood, Texas, Sergeant, United States Marine Corps – died June 6, 2010, while supporting combat operations in Helmand Province, Afghanistan. He was assigned to 3rd Battalion, 1st Marine Regiment, 1st Marine Division, I Expeditionary Force, Camp Pendleton, California. The Cemetery flew the Memorial Flag at half-staff in Sergeant Bury’s honor on June 10, 2010. Hernandez, Derek, Edinburg, Texas, Lance Corporal, United States Marine Corps – died June 6, 2010, while supporting operations in Helmand Province, Afghanistan. He was assigned to 3rd Battalion, 1st Marine Regiment, 1st Marine Division, I Expeditionary Force, Camp Pendleton, California. The Cemetery flew the Memorial Flag at half-staff in Lance Corporal Hernandez’s honor on June 11, 2010. Flores, Michael P., San Antonio, Texas, Staff Sergeant, United States Air Force – died June 9, 2010, while supporting Operation Enduring Freedom near Forward Operating Base Jackson, Afghanistan, in a helicopter crash. He was assigned to the 48th Rescue Squadron, Davis-Monthan Air Force Base, Arizona. The Cemetery flew the Memorial Flag at half-staff in Staff Sergeant Flores’ honor on June 15, 2010. Rodriguez, Mario, Smithville, Texas, Sergeant, United States Army – died June 11, 2010, when insurgents attacked his unit using small arms and rocket-propelled grenade fires in Powrak, Afghanistan. He was assigned to the 264th Clearance Company, 27th Engineer battalion (Combat) (Airborne), 20th Engineer Brigade, Fort Bragg, North Carolina. The Cemetery flew the Memorial Flag at half-staff in Sergeant Rodriguez’s honor on June 17, 2010. Catlett, Matthew R., Houston, Texas, Specialist, United States Army – died June 7, 2010, when enemy forces attacked his vehicle with an improvised explosive device, Konar, Afghanistan. He was assigned to the 2nd Battalion, 327th Infantry Regiment, 1st Brigade Combat Team, 101st Airborne Division (Air Assault), Fort Campbell, Kentucky. The Cemetery flew the Memorial Flag at half-staff in Specialist Catlett’s honor on June 18, 2010. Loredo, Edwardo, Houston, Texas, Staff Sergeant, United States Army – died June 24, 2010, when insurgents attacked his unit with an improvised explosive device, Jelewar, Afghanistan. He was assigned to 2nd Battalion, 508th Parachute Infantry Regiment, 4th Brigade Combat Team, 82nd Airborne Division, Fort Bragg, North Carolina. The Cemetery flew the Memorial Flag at half-staff in Staff Sergeant Loredo’s honor on July 6, 2010. Osborne, Jerod H., Royse City, Texas, Specialist, United States Army – died July 5, 2010, when insurgents attacked his unit using an improvised explosive device, Yakuta, Afghanistan. He was assigned to the 4th Squadron, 73rd Armor Regiment, 4th Brigade Combat Team, 82nd Airborne Division, Fort Bragg, North Carolina. The Cemetery flew the Memorial Flag at half-staff in Specialist Osborne’s honor on July 13, 2010. Ainsworth, Jesse W., Dayton, Texas, Staff Sergeant, United States Army – died July 10, 2010, when insurgents attacked his unit using an improvised explosive device, Walakan, Afghanistan. He was assigned to the 1st Squadron, 71st Cavalry Regiment, 1st Brigade Combat Team, 10th Mountain Division (Light Infantry), Fort Drum, New York. The Cemetery flew the Memorial Flag at half-staff in Staff Sergeant Ainsworth’s honor on July15, 2010. Mittler, Shaun M., Austin, Texas, Sergeant, United States Army – died July 10, 2010, when enemy forces attacked his unit using rocket-propelled grenade and small arms fire, Konar, Afghanistan. He was assigned to the 1st Battalion, 327th Infantry Regiment, 1st Brigade Combat Team, 101st Airborne Division (Air Assault), fort Campbell, Kentucky. The Cemetery flew the Memorial Flag at half-staff in Sergeant Mittler’s honor on July 16, 2010. Winters, Leston M., Sour Lake, Texas, Sergeant, United States Army – died July 15, 2010, when enemy forces attacked their unit with an improvised explosive device, Kandahar, Afghanistan. He was assigned to the 1st Battalion, 502nd Infantry Regiment, 2nd Brigade Combat Team, 101st Airborne Division (Air Assault), Fort Campbell, Kentucky. The Cemetery flew the Memorial Flag at half-staff in Sergeant Winters honor on July 23, 2010. Oquin, James J., El Paso, Texas, Private First Class, United States Army – died July 23, 2010, when he was swept away by the current when a levee broke near his military vehicle in Paktika, Afghanistan. He was assigned to the 1st Battalion, 187th Infantry Regiment, 3rd Brigade Combat Team, 101st Airborne Division (Air Assault), Fort Campbell, Kentucky. The Cemetery flew the Memorial Flag at half-staff in Private First Class Oquin’s honor on August 2, 2010. Martin, Shane R., Spring, Texas, Lance Corporal, United State Marine Corps – died July 29, 2010, while supporting combat operations in Helmand province, Afghanistan. He was assigned to the 1st Light Armored Reconnaissance Battalion, 1st Marine Division, I Marine Expeditionary Force, Camp Pendleton, California. The Cemetery flew the Memorial Flag at half-staff in Lance Corporal Martin’s honor on August 3, 2010. Holbrook, Jason E., Burnet, Texas, Captain, United States Army – died July 29, 2010, when insurgents attacked his military vehicle with improvised explosive device, Tsagay, Afghanistan. He was assigned to the 1st Battalion, 3rd Special Forces Group (Airborne), Fort Bragg, North Carolina. The Cemetery flew the Memorial Flag at half-staff in Captain Holbrook’s honor on August 4, 2010. Stout, Kyle B., Texarkana, Texas, Sergeant, United States Army – died July 30, 2010, when insurgents attacked his unit with an improvised explosive device, Kandahar, Afghanistan. He was assigned to the 1st Battalion, 320th Field Artillery Regiment, 2nd Brigade Combat Team, 101st Airborne Division (Air Assault), Fort Campbell, Kentucky. The Cemetery flew the Memorial Flag at half-staff in Sergeant Stout’s honor on August 5, 2010. Andrade, John E., San Antonio, Texas, Private First Class, United States Army – died August 7, 2010, when insurgents attacked his unit using an improvised explosive device, Kandahar, Afghanistan. He was assigned to the 3rd Squadron, 2nd Stryker Cavalry Regiment, Vilseck, Germany. The Cemetery flew the Memorial Flag at half-staff in Private First Class Andrade’s honor on August 17, 2010. Chisholm, Benjamen G., Fort Worth, Texas, Private First Class, United States Army – died August 17, 2010, when an improvised explosive device caused a military roll-over, Kunar Province, Afghanistan. He was assigned to the 1st Battalion, 327th Infantry Regiment, 1st brigade Combat Team, 101st Airborne Division (Air Assault), Fort Campbell, Kentucky. The Cemetery flew the Memorial Flag at half-staff in Private First Class Chisholm’s honor on August 23, 2010. Maldonado, Alexis V., Wichita Falls, Texas, Private First Class, United States Army – died August 21, 2010, when insurgents attacked his unit using small arms fire in Zhari Province, Afghanistan. He was assigned to the 20th Engineer battalion, 36th Engineer Brigade, Fort Hood, Texas. The Cemetery flew the Memorial Flag at half-staff in Private First Class Maldonado’s honor on August 30, 2010. Infante, Jesse, Cypress, Texas, Staff Sergeant, United States Army – died August 30, 2010, when insurgents attacked his unit with an IED in Arghandab River Valley, Afghanistan. He was assigned to the 4th Brigade Support battalion, 1st Brigade Combat Team, 4th Infantry Division, Fort Carson, Colorado. The Cemetery flew the Memorial Flag at half-staff in Staff Sergeant Infante’s honor on September 11, 2010. Saenz (III), Jose L., Pleasanton, Texas, Sergeant, United States Marine Corps. – died August 9, 2010, while supporting combat operations in Helmand Province, Afghanistan. He was assigned to 1st Battalion, 11th Marine Regiment, 1st Marine Division, I Marine Expeditionary Force, Camp Pendleton, California. The Cemetery flew the Memorial Flag at half-staff in Sergeant Saenz’s honor on September 13, 2010. Montoya, Diego M., San Antonio, Texas, Private First Class, United States Army – died September 2, 2010, when insurgents attacked his unit with indirect fire in Laghman Province, Afghanistan. He was assigned to the 720th Military Police Battalion, 89th Military Police Brigade, Fort Hood, Texas. The Cemetery flew the Memorial Flag at half-staff in Private First Class Montoya’s honor on September 14, 2010. Sanchez, Daniel R., El Paso, Texas, Senior Airman, United States Air Force – died September 16, 2010, while conducting combat operations in Oruzgan Province, Afghanistan. He was assigned to the 23rd Special Tactics Squadron, Hurlburt Field, Florida. The Cemetery flew the Memorial Flag at half-staff in Senior Airman Sanchez’s honor on September 25, 2010. Harrison, Calvin B., San Antonio, Texas, Sergeant 1st Class, United States Army – died September 29, 2010, when insurgents attacked his unit with small arms fire in Uruzgan Province, Afghanistan. He was assigned to 2nd Battalion, 7th Special Forces Group (Airborne) Fort Bragg, North Carolina. The Cemetery flew the Memorial Flag at half-staff in Sergeant 1st Class Harrison’s honor on October 6, 2010. Board, Cody A., McKinney, Texas, Private First Class, United States Army – died October 4, 2010, when insurgents attacked his unit with an improvised explosive device in Mirwais, Afghanistan. He was assigned to the 1st Squadron, 2nd Stryker Cavalry Regiment, Vilseck, Germany. The Cemetery flew the Memorial Flag at half-staff in Private First Class Board’s honor on October 11, 2010. Benitez, Carlos A, Carrollton, Texas, Sergeant, United States Army – died October 14, 2010, when insurgents attacked his unit with an improvised explosive device between Moqur and Darreh-Ye-Bum, Afghanistan. He was assigned to 7th Squadron, 10th Cavalry Regiment, 1st Brigade Combat Team, 4th Infantry Division, Fort Carson, Colorado. The Cemetery flew the Memorial Flag at half-staff in Sergeant Benitez’s honor on October 20, 2010. Villarreal, Jorge, Jr., San Antonio, Texas, Corporal, United States Marine Corps – died October 17, 2010, conducting combat operations in Helmand Province, Afghanistan. He was assigned to 1st Battalion, 11th Marine Regiment, 1st Marine Division, I Marine Expeditionary Force, Camp Pendleton, California. The Cemetery flew the Memorial Flag at half-staff in Corporal Villarreal’s honor on October 21, 2010. Maldonado, Pedro A., Houston, Texas, Specialist, United States Army – died October 29, 2010, when insurgents attacked his unit with rocket-propelled grenades and small arms fire in Kandalay, Afghanistan. He was assigned to the 1st Battalion, 502nd Infantry Regiment, 2nd Brigade Combat Team, 101st Airborne Division (Air Assault), Fort Campbell, Kentucky. The Cemetery flew the Memorial Flag at half-staff in Specialist Maldonado’s honor on November 4, 2010. Holder, Kyle M., Conroe, Texas, Private First Class, United States Army – died November 17, 2010, at Kandahar Airfield, Afghanistan. He was assigned to the 1st Squadron, 38th Cavalry Regiment (Reconnaissance and Surveillance), 525th Battlefield Surveillance Brigade, XVIII Airborne Corps, Fort Bragg, North Carolina. The Cemetery flew the Memorial Flag at half-staff in Private First Class Holder’s honor on November 24, 2010. Harris, Devon J., Mesquite, Texas, Private, United States Army – died November 28, 2010, when insurgents attacked his unit with a rocket-propelled grenade in Wardak Province, Afghanistan. He was assigned to the Brigade Special Troops Battalion, 10th Mountain Division, Fort Polk, Louisiana. The Cemetery flew the Memorial Flag at half-staff in Private Harris’s honor on December 1, 2010. Reeves, Jason A., Odessa, Texas, Staff Sergeant, United States Army – died December 5, 2010, when insurgents attacked his unit using an improvised explosive device at Gardez District, Paktia Province, Afghanistan. He was assigned to the 2nd Military Intelligence Battalion, 66th Military Intelligence Brigade, Hohenfels, Germany. The Cemetery flew the Memorial Flag at half-staff in Staff Sergeant Reeves honor on December 9, 2010. Rusk, Colton W., Orange Grove, Texas, Private First Class, United States Marine Corps – died December 6, 2010, conducting combat operations in Helmand Province, Afghanistan. He was assigned to the 3rd Battalion, 5th Marine Regiment, 1st Marine Division, I Marine Expeditionary Force, Camp Pendleton, California. The Cemetery flew the Memorial Flag at half-staff in Private First Class Rusk’s honor on December 10, 2010. Maldonado, Jose L., Mathis, Texas, Lance Corporal, United States Marine Corps – died December 17, 2010, conducting combat operations in Helmand Province, Afghanistan. He was assigned to 3rd Battalion, 5th Marine Regiment, 1st Marine Division, I Marine Expeditionary Force, Camp Pendleton, California. The Cemetery flew the Memorial Flag at half-staff in Lance Corporal Maldonado’s honor on December 23, 2010. Nguyen, Tevan L., Hutto, Texas, Corporal, United States Marine Corps – died December 28, 2010, conducting combat operations in Helmand Province, Afghanistan. He was assigned to the 3rd Battalion, 5th Marine Regiment, 1st Marine Division, I Marine Expeditionary Force, Camp Pendleton, California. The Cemetery flew the Memorial Flag at half-staff in Corporal Nguyen’s honor on January 6, 2011. Laningham, Ira B., Zapata, Texas, Private First Class, United States Army – died January 7, 2011, at Logar Province, Afghanistan, when insurgents attacked his unit using an improvised explosive device and small arms fire. He was assigned to the 2nd Battalion, 30th Infantry Regiment, 4th Brigade Combat Team, 10th Mountain Division, Fort Polk, Louisiana. The Cemetery flew the Memorial Flag at half-staff in Private First Class Laningham’s honor on January 14, 2011. Aceves, Omar, El Paso, Texas, Sergeant, United States Army – died January 12, 2011, when enemy forces attacked his unit with an improvised explosive device in Ghazni province, Afghanistan. He was assigned to the 7th Engineer Battalion, 10th Sustainment Brigade, 10th Mountain Division, Fort Drum, New York. The Cemetery flew the Memorial Flag at half-staff in Sergeant Aceves honor on January 17, 2011. Creamer, Zainah C., Texarkana, Texas, United States Army – died January 12, 2011, when insurgents attacked her unit with an improvised explosive device in Kandahar Province, Afghanistan. She was assigned to the 212th Military Police Department, Headquarters Battalion, Fort Belvoir, Virginia. The Cemetery flew the Memorial Flag at half-staff in Sergeant Creamer’s honor on January 24, 2011. Soltero, Omar, San Antonio, Texas, Specialist, United States Army – died January 31, 2011, when insurgents attacked his unit using an improvised explosive device in Wardak province, Afghanistan. He was assigned to the 2nd Battalion, 4th Infantry Regiment, 4th Brigade Combat Team, 10th Mountain Division, Fort Polk, Louisiana. The Cemetery flew the Memorial Flag at half-staff in Specialist Soltero’s honor on February 7, 2011. Mays, Chauncy R., Cookville, Texas, Staff Sergeant, United States Army – died February 28, 2011, when enemy forces attacked his unit with an improvised explosive device in Wardak, Province, Afghanistan. He was assigned to the 63rd Explosive ordnance Disposal Battalion, 20th Support command, Aberdeen Proving Ground, Maryland. The Cemetery flew the Memorial Flag at half-staff in Staff Sergeant Mays honors on March 9, 2011. McDaniel, Mecolus C., Fort Hood, Texas, Staff Sergeant, United States Army – died March 19, 2011, when insurgents attacked his unit with an improvised explosive device and small arms fire in Khowst Province, Afghanistan. He was assigned to the 6th Squadron, 4th Cavalry Regiment, 3rd Brigade Combat Team, 1st Infantry Division, Fort Knox, Kentucky. The Cemetery flew the Memorial Flag at half-staff in Staff Sergeant McDaniel’s honor on March 29, 2011. Burgess, Bryan A., Cleburne, Texas, Staff Sergeant, United States Army – died March 29, 2011, when enemy forces attacked his unit with small arms fire in Konar Province, Afghanistan. He was assigned to the 2nd Battalion, 327th Infantry Regiment, 1st Briade Combat Team, 101st Airborne Division (Air Assault), Fort Campbell, Kentucky. The Cemetery flew the Memorial Flag at half-staff in Staff Sergeant Burgess honor on April 4, 2011. Owens, Corey C., San Antonio, Texas, Airman 1st Class, United States Air Force – died February 17, 2011, at Al Asad Air Base, Iraq. He was assigned to the 47th Security Forces Squadron, Laughlin Air Force Base, Texas. The Cemetery flew the Memorial Flag at half-staff in Airman 1st Class Owens honor on April 5, 2011. Welch, Robert F. III, Denton, Texas, 1st Lieutenant, United States Army – died April 3, 2011, when insurgents attacked his base with indirect fire in Khost Province, Afghanistan. He was assigned to the 201st brigade Support Battalion, 3rd Brigade Combat Team, 1st Infantry Division, Fort Knox, Kentucky. The Cemetery flew the Memorial Flag at half-staff in Lieutenant Welch’s honor on April 11, 2011. Burgess, Scott H., Franklin, Texas, Sergeant, United States Army – died April 4, 2011, of wounds suffered from small arms fire in Faryab Province, Afghanistan. He was assigned to the 1st Battalion, 84th Field Artillery Regiment, 170th Infantry Brigade Combat Team, Baumholder, Germany. The Cemetery flew the Memorial Flag at half-staff in Sergeant Burgess honor on April 12, 2011. Smith, Jeremy D., Arlington, Texas, Staff Sergeant, United States Marine Corps – died April 6, 2011, conducting combat operations in Helmand Province, Afghanistan. He was assigned to the 1st Battalion, 23rd Marine Regiment, 4th Marine Division, Marine Forces Reserve, Houston, Texas. The Cemetery flew the Memorial Flag at half-staff in Staff Sergeant Smith’s honor on April 14, 2011. Wren, Charles J., Beeville, Texas, Specialist, United States Army – died April 16, 2011, when insurgents attacked his unit with an improvised explosive device in Nimroz Province, Afghanistan. He was assigned to the 1st Battalion, 32nd Infantry Regiment, 3rd Brigade Combat Team, 10th Mountain Division, Fort Drum, New York. The Cemetery flew the Memorial Flag at half-staff in Specialist Wren’s honor on April 21, 2011. Ramirez, Joel A., Waxahachie, Texas, Private First Class, United States Army – died April 16, 2011, when insurgents attacked his unit with improvised explosive device in Nimroz Province, Afghanistan. He was assigned to the 1st Battalion, 32 Infantry Regiment, 3rd Brigade Combat Team, 10th Mountain Division, Fort Drum, New York. The Cemetery flew the Memorial Flag at half-staff in Private First Class Ramirez honor on April 22, 2011. Castro, John P., Andrews, Texas, Sergeant, United States Army – died April 22, 2011, when his unit was attacked by small arms fire in Paktika Province, Afghanistan. He was assigned 1st Battalion, 506th Infantry Regiment, 4th Brigade Combat Team, 101st Airborne Division, Fort Campbell, Kentucky. The Cemetery flew the Memorial Flag at half-staff in Sergeant Castro’s honor on May 2, 2011. Nylander, Nathan J., Hockley, Texas Captain, United States Air Force – died April 27, 2011, from gunfire at the Kabul International Airport in Afghanistan. He was assigned to the 25th Operational Weather Squadron, Davis-Monthan Air Force Base, Arizona. The Cemetery flew the Memorial Flag at half-staff in Captain Nylander’s honor on May 6, 2011. Spaulding, Riley S., Sheridan, Texas, Specialist, United States Army – died May 4, 2011, in Kandahar Province, Afghanistan. He was assigned to the 2nd Squadron, 2nd stryker Cavalry Regiment, Vilseck, Germany. The Cemetery flew the Memorial Flag at half-staff in Specialist Spaulding’s honor on May 11, 2011. Krippner, Andrew M., Garland, Texas, Private, United States Army – died May 23, 2011, when enemy forces attacked his unit with an improvised explosive device in Kunar province, Afghanistan. He was assigned to the 2nd Battalion, 27th Infantry Regiment, 3rd Brigade Combat Team, 25th Infantry Division, Schofield Barracks, Hawaii. The Cemetery flew the Memorial Flag at half-staff in Private Krippner’s honor on May 31, 2011. Nunn, Anthony M., Burnet, Texas, Private First Class, United States Army – died May 30, 2011, when insurgents attacked his unit using an improvised explosive device in Paktika province, Afghanistan. He was assigned to the 2nd Battalion, 506th Infantry Regiment, 4th Brigade Combat Team, 101st Airborne Division, Fort Campbell, Kentucky. The Cemetery flew the Memorial Flag at half-staff in Private First Class Nunn’s honor on June 2, 2011. Powell, Joshua D., Quitman, Texas, Sergeant, United States Army – died June 4, 2011, when insurgents attacked his unit with an improvised explosive device in Laghman Province, Afghanistan. He was assigned 793rd Military Police Battalion, 3rd Maneuver Enhancement Brigade, Joint Base Elmendorf-Richardson, Alaska. The Cemetery flew the Memorial Flag at half-staff in Sergeant Powell’s honor on June 10, 2011. Gaudet, Bradley J., Gladewater, Texas, Chief Warrant Officer, United States Army – died June 5, 2011, as the result of a helicopter crash in Khost Province, Afghanistan. He was assigned to the 1st Battalion, 10th Aviation Regiment, 10th Combat Aviation Brigade, 10th Mountain Division, Fort Drum, New York. The Cemetery flew the Memorial Flag at half-staff in Chief Warrant Officer Gaudet’s honor on June 13, 2011. Sewell, Glenn M., Live Oak, Texas, Sergeant, United States Army – died June 13, 2011, when enemy forces attacked his unit with an improvised explosive device in Wasit Province, Iraq. He was assigned to the 6th Squadron, 9th Cavalry Regiment, 3rd Brigade Combat Team, 1st Cavalry Division, Fort Hood, Texas. The Cemetery flew the Memorial Flag at half-staff in Sergeant Sewell’s honor on June 22, 2011. Bellard, Nicholas P., El Paso, Texas, Staff Sergeant, United States Army – died June 13, 2011, when enemy forces attacked his unit with an improvised explosive device in Wasit Province, Iraq. He was assigned to 6th Squadron, 9th Cavalry Regiment, 3rd Brigade Combat Team, 1st Cavalry Division, Fort Hood, Texas. The Cemetery flew the Memorial Flag at half-staff in Staff Sergeant Bellard’s honor on June 23, 2011. Ibarra, Josue, Midland, Texas, Private First Class, United States Marine Corps – died June 19, 2011, while conducting combat operations in Helmand Province, Afghanistan. He was assigned the 1st Batallion, 12th Marine Regiment, 3rd Marine Division, Kaneohe Bay, Hawaii. The Cemetery flew the Memorial Flag at half-staff in Private First Class Ibarra’s honor on June 24, 2011. Farias, John F., New Braunfels, Texas, Lance Corporal, United States Marine Corps – died June 28, 2011, while conducting combat operations in Helmand Province, Afghanistan. He was assigned to 1st Battalion, 5th Marine Regiment, 1st Marine Division, I Marine Expeditionary Force, Camp Pendleton, California. The Cemetery flew the Memorial Flag at half-staff in Lance Corporal Farias’s honor on July 7, 2011. Goyet, Mark R., Sinton, Texas, Lance Corporal, United States Marine Corps – died June 28, 2011, while conducting combat operations in Helmand Province, Afghanistan. He was assigned to 3rd Battalion, 4th Marine Regiment, 1st Marine Division, I Marine Expeditionary Force, Twentynine Palms, California. The Cemetery flew the Memorial Flag at half-staff in Lance Corporal Goyet’s honor on July 8, 2011. Talamantez, Steven, Laredo, Texas, Sergeant, United States Army – died July 10, 2011, when enemy forces attacked his unit in Al Amarah, Iraq. He was assigned to the 3rd Battalion, 8th Cavalry Regiment, 3rd Brigade Combat Team, 1st Cavalry Division, Fort Hood, Texas. The Cemetery flew the Memorial Flag at half-staff in Sergeant Talamantez’s honor on July 12, 2011. Molina, Jacob, Houston, Texas, Sergeant, United States Army – died July 19, 2011, when enemy forces attacked his vehicle with an improvised explosive device in Kunar Province, Afghanistan. He was assigned to the 2nd Battalion, 27th Infantry Regiment, 3rd Brigade Combat Team, 25th Infantry Division, Schofield Barracks, Hawaii. The Cemetery flew the Memorial Flag at half-staff in Sergeant Molina’s honor on July 27, 2011. Stevenson, Benjamin A., Canyon Lake, Texas, Master Sergeant, United States Army – died July 21, 2011, when insurgents attacked his unit using small arms fire in Paktika Province, Afghanistan. He was assigned to the U.S. Army Special Operations Command, Fort Bragg, North Carolina. The Cemetery flew the Memorial Flag at half-staff in Master Sergeant Stevenson’s honor on July 28, 2011. Mills, Stephen M., Fort Worth, Texas, Special Warfare Operator Chief Petty Officer, United States Navy – died August 6, 2011, when a CH-47 Chinook helicopter crashed in Wardak Province, Afghanistan. He was assigned to an East Coast-based Naval Special Warfare unit. The Cemetery flew the Memorial Flag at half-staff in Chief Petty Officer Mills’s honor on August 16, 2011. Price, Charles L., Milam, Texas, Master Sergeant, United States Army – died August 12, 2011, when enemy forces attacked his unit with an improvised explosive device in Kandahar Province, Afghanistan. He was assigned to headquarter and Headquarters Company, 2nd Brigade Combat Team, 4th Infantry Division, Fort Carson, Colorado. The Cemetery flew the Memorial Flag at half-staff in Master Sergeant Price’s honor on August 22, 2011. Dietrich, Jesse W., Venus, Texas, Private First Class – United States Army – died August 25, 2011, when insurgents attacked his unit using small arms fire in Kandahar Province, Afghanistan. He was assigned to the 2nd Battalion, 87th Infantry Regiment, 3rd Brigade Combat Team, 10th Mountain Division, Fort Drum, New York. The Cemetery flew the Memorial Flag at half-staff in Private First Class Dietrich’s honor on August 31, 2011. Roberts, Michael C., Watauga, Texas, Specialist – United States Army – died August 27, 2011, when insurgents attacked his unit using an improvised explosive device in Kandahar Province, Afghanistan. He was assigned to the 561st Military Police Company, 716th Military Police Battalion, 101st Sustainment Brigade, Fort Campbell, Kentucky. The Cemetery flew the Memorial Flag at half-staff in Specialist Roberts honor on September 1, 2011. Lundy, Brian K., Austin, Texas, Petty Officer – United States Navy – died September 9, 2011, while conducting a dismounted patrol in Marjah, Helmand Province, Afghanistan. He was assigned as a hospital corpsman to 1st Battalion, 6th Marine Regiment, Regimental Combat Team 5, 2nd marine Division, II Marine Expeditionary Force, Camp Lejeuene, North Carolina. The Cemetery flew the Memorial Flag at half-staff in Petty Officer Lundy’s honor on September 21, 2011. Rodriguez, Rodolfo, Pharr, Texas, Sergeant – United States Army – died September 14, 2011, when insurgents attacked his unit with an improvised explosive device in Kandahar Province, Afghanistan. He was assigned to the 3rd Battalion, 21st Infantry Regiment, 1st Stryker brigade Combat Team, 25th Infantry Division, Fort Wainwright, Alaska. The Cemetery flew the Memorial Flag at half-staff in Sergeant Rodriguez’s honor on September 22, 2011. Altamirano, Esteven, Edcouch, Texas, Staff Sergeant, United States Army – died September 18, 2011, in Tikrit, Iraq. He was assigned to the 1st Battalion, 5th Cavalry Regiment, 2nd Brigade Combat Team, 1st Cavalry Division, Fort Hood, Texas. The Cemetery flew the Memorial Flag at half-staff in Staff Sergeant Altamirano’s honor on September 28, 2011. Zermeno, Andres, San Antonio, Texas, 1st Lieutenant, United States Army – died September 25, 2011, when enemy forces attacked his unit with a rocket propelled grenade in Wardak Province, Afghanistan. He was assigned to the 2nd Battalion, 4th Infantry Regiment, 4th Brigade Combat Team, 10th Mountain Division, Fort Polk, Louisiana. The Cemetery flew the Memorial Flag at half-staff in 1st Lieutenant Zermeno’s honor on October 7, 2011. Drake, David A., Lumberton, Texas, Private First Class, United States Army – died September 28, 2011, when enemy forces attacked his unit with an improvised explosive device in Ghazni Province, Afghanistan. He was assigned to the 5th Engineer Battalion, 4th Maneuver Enhancement Brigade, Fort Leonard Wood, Missouri. The Cemetery flew the Memorial Flag at half-staff in Private First Class Drake’s honor on October 10, 2011. Schmidt, Benjamin W., San Antonio, Texas, Lance Corporal, United States Marine Corps – died October 6, 2011, while conducting combat operations in Helmand Province, Afghanistan. He was assigned to 2nd Battalion, 4th Marine Regiment, 1st Marine Division, I Marine Expeditionary Force, Camp Pendleton, California. The Cemetery flew the Memorial Flag at half-staff in Lance Corporal Schmidt’s honor on October 12, 2011. Taylor, Houston M., Hurst, Texas, Staff Sergeant, United States Army – died October 13, 2011, when insurgents attacked his unit with small arms fire in Kunar Province, Afghanistan. He was assigned to the 2nd Battalion, 27th Infantry Regiment, 3rd Brigade, 25th Infantry Division, Schofield Barracks, Hawaii. The Cemetery flew the Memorial Flag at half-staff in Staff Sergeant Taylor’s honor on October 21, 2011. Rivera, Paul A., Round Rock, Texas, Corporal, United States Army – died October 22, 2011, during an attack by enemy forces in Logar Province, Afghanistan. He was assigned to the 709th Military Police battalion, 18th Military Police Brigade, 21st Theater Sustainment Command, Hohenfels, Germany. The Cemetery flew the Memorial Flag at half-staff in Corporal Rivera’s honor on October 28, 2011. Vincent, Dustin D., Mesquite, Texas, 1st Lieutenant, United States Army – died November 3, 2011, when enemy forces attacked his unit with small arms fire in Kirkuk Province, Iraq. He was assigned to the 1st Battalion, 5th Field Artillery, 1st Brigade Combat Team, 1st Infantry Division, Fort Riley, Kansas. The Cemetery flew the Memorial Flag at half-staff in 1st Lt. Vincent’s honor on November 11, 2011. Cabrera, David E., Abilene, Texas, Lt. Colonel, United States Army – died October 29, 2011, when enemy forces attacked his vehicle with a vehicle-borne improvised explosive device in Kabul Province, Afghanistan. He was assigned to the Uniformed Services University of Health Sciences, Bethesda, Maryland. The Cemetery flew the Memorial Flag at half-staff in Lt. Colonel Cabrera’s honor on November 18, 2011. Darrough, James M., Austin, Texas, Sergeant, United States Army – died October 29, 2011, when enemy forces attacked his vehicle with a vehicle-borne improvised explosive device in Kabul Province, Afghanistan. He was assigned to 101st Finance Company, 101st Special Troops Battalion, 101st Sustainment brigade, 101st Airborne Division (Air Assault), Fort Campbell, Kentucky. The Cemetery flew the Memorial Flag at half-staff in Sergeant Darrough’s honor on November 21, 2011. Norris, Cody R., Houston, Texas, Private First Class – died November 9, 2011, when enemy forces attacked his unit with small arms fire in Kandahar Province, Afghanistan. He was assigned to the 2nd Battalion, 34th Armor Regiment, 1st heavy Brigade Combat Team, 1st Infantry Division, Fort Riley, Kansas. The Cemetery flew the Memorial Flag at half-staff in Private First Class Norris’s honor on November 22, 2011. Kern, Kurt W., McAllen, Texas, Specialist, United States Army – died December 27, 2011, when enemy forces attacked his unit with an improvised explosive device in Paktia, Afghanistan. He was assigned to the 720th Military Police Battalion, 89th Military Police Brigade, Fort Hood, Texas. The Cemetery flew the Memorial Flag at half-staff in Specialist Kern’s honor on January 5, 2012. Logan, Joseph D., Willis, Texas, Corporal, United States Marine Corps – died January 19, 2012, while supporting combat operations in Helmand Province, Afghanistan. He was assigned to Marine Heavy Helicopter Squadron 363, Marine Aircraft Group 24, 1st Marine Aircraft Wing, III Marine Expeditionary Force, Kaneohe Bay, Hawaii. The Cemetery flew the Memorial Flag at half-staff in Corporal Logan’s honor on January 28, 2012. Jones, Payton A., Marble Falls, Texas, Private First Class, United States Army – died March 1, 2012, from small arms fire during an attack at his base in Kandahar Province, Afghanistan. He was assigned to the 2nd Battalion, 508th Parachute Infantry Regiment, 4th Brigade Combat Team, 82 Airborne Division, Fort Bragg, North Carolina. The Cemetery flew the Memorial Flag at half-staff in Private First Class Jones’ honor on March 8, 2012. Ray, Clovis T., San Antonio, Texas, 2nd Lieutenant, United States Army – died March 15, 2012, when insurgents attacked his unit with an improvised explosive device in Kunar Province, Afghanistan. He was assigned to the 2nd Battalion, 35th Infantry Regiment, 3rd Brigade Combat Team, 25th Infantry Division, Schofield Barracks, Hawaii. The Cemetery flew the Memorial Flag at half-staff in 2nd Lieutenant Ray’s honor on March 26, 2012. Schiller, Philip C. S., The Colony, Texas, Specialist, United States Army – died April 11, 2012, when enemy forces attacked his unit with small arms fire in Kandahar Province, Afghanistan. He was assigned to the 1st Battalion, 23rd Infantry Regiment, 3rd Stryker Brigade Combat Team, 2nd Infantry Division, Joint Base Lewis – McChord, Washington. The Cemetery flew the Memorial Flag at half-staff in Specialist Schiller’s honor on April 18, 2012. Higgins, Tanner S., Yantis, Texas, Sergeant, United States Army – died April 14, 2012, when enemy forces attacked his unit with small arms fire in Logar Province, Afghanistan. He was assigned to the 1st Battalion, 75th Ranger Regiment, Hunter Army Airfield, Georgia. The Cemetery flew the Memorial Flag at half-staff in Sergeant Higgins’s honor on April 19, 2012. Frankhauser, Joseph H., Mason, Texas, Staff Sergeant, United States Marine Corps – died April 22, 2012, while conducting combat operations in Helmand Province, Afghanistan. He was assigned to 7th Engineer Support Battalion, 1st Marine Logistics Group, I Marine Expeditionary Force, Camp Pendleton, California. The Cemetery flew the Memorial Flag in Staff Sergeant Franhauser’s honor on April 26, 2012. Wilson, Wade D., Normangee, Texas, Sergeant, United States Marine Corps – died May 11, 2012, while conducting combat operations in Helmand Province, Afghanistan. He was assigned to 2nd Battalion, 5th Marine Regiment, 1st marine Division, I Marine Expeditionary Force, Camp Pendleton, California. The Cemetery flew the Memorial Flag in Sergeant Wilson’s honor on May 17, 2012. Hernandez, Alex III, Round Rock, Texas, Specialist, United States Army – died May 12, 2012, supporting Operation Enduring Freedom in Kandahar, Afghanistan. He was assigned to 3rd Battalion, 25th Aviation Regiment, 25th Combat Aviation Brigade, 25th Infantry Division, Wheeler Army Airfield, Hawaii. The Cemetery flew the Memorial Flag in Specialist Hernandez’s honor on May 18, 2012. Loeza, Roberto, El Paso, Texas, Staff Sergeant, United States Army – died May 25, 2012, when enemy forces attacked his unit with indirect fire. He was assigned to the 1st Battalion, 41st Infantry Regiment, 3rd Brigade Combat Team, 1st Armored Division, Fort Bliss, Texas. The Cemetery flew the Memorial Flag in Staff Sergeant Loeza’s honor on June 7, 2012. Navarro, Juan P., Austin, Texas, Corporal, United States Army – died July 7, 2012, when he was attacked with an enemy improvised explosive device in Kandahar, Afghanistan. He was assigned to the 1st Battalion, 23rd Infantry Regiment, 3rd Stryker Brigade Combat Team, 2nd Infantry Division, Joint Base Lewis – McChord, Washington. The Cemetery flew the Memorial Flag in Corporal Navarro’s honor on July 13, 2012. Fitts, Krystal M., Houston, Texas, Specialist, United States Army – died July 17, 2012, from injuries suffered in Kandahar, Afghanistan. She was assigned to the 1st Battalion, 508th Parachute Infantry Regiment, 4th Brigade Combat Team, 82nd Airborne Division, Fort Bragg, North Carolina. The Cemetery flew the Memorial Flag in Specialist Fitts’s honor on July 27, 2012. Hansen, John E., Austin, Texas, Sergeant, United States Army – died July 26, 2012, when he was attacked with an enemy improvised explosive device in Khakrez, Afghanistan. He was assigned to the 2nd Battalion, 17th Field Artillery Regiment, 2nd Stryker Brigade Combat Team, 2nd Infantry Division, Joint Base Lewis-McChord, Washington. The Cemetery flew the Memorial Flag in Sergeant Hansen’s honor on August 3, 2012. Bell, Russell R., Tyler, Texas, First Sergeant, United States Army – died August 2, 2012, when he encountered an enemy improvised explosive device in Kandahar, Afghanistan. He was assigned to the 1st Battalion, 508th Parachute Infantry Regiment, 4th Brigade Combat Team, 82nd Airborne, Division, Fort Bragg, North Carolina. The Cemetery flew the Memorial Flag in First Sergeant Bell’s honor on August 10, 2012. Beauchamp, Clayton R., Weatherford, Texas, Petty Officer 3rd Class, United States Navy – died August 7, 2012, when enemy forces attacked his unit with an improvised explosive device while conducting a dismounted patrol in the Shaban District, Helmand Province, Afghanistan. He was assigned to 1st Battalion, 1st Marine Regiment, Regimental Combat Team 6, 1st Marine Division (Forward), I Marine Expeditionary Force (Forward), Camp Pendleton, California. The Cemetery flew the Memorial Flag in Petty Officer Beauchamp’s honor on August 17, 2012. Ramirez, Thalia S., San Antonio, Texas, Chief Warrant Officer 2, United States Army – died September 5, 2012, when her aircraft crashed in Logar Province, Afghanistan. She was assigned to the 1st Squadron, 17th Cavalry Regiment, 82nd Combat Aviation Brigade, 82nd Airborne Division, Fort Bragg, North Carolina. The Cemetery flew the Memorial Flag in Chief Warrant Officer Ramirez’s honor on September 22, 2012. Montenegro, Jose L., Houston, Texas, Chief Warrant Officer 2, United States Army – died September 5, 2012, when his aircraft crashed in Logar Province, Afghanistan. He was assigned to the 1st Squadron, 17th Cavalry Regiment, 82nd Combat Aviation Brigade, 82nd Airborne Division, Fort Bragg, North Carolina. The Cemetery flew the Memorial Flag in Chief Warrant Officer Montenegro’s honor on September 23, 2012. Bedoy, Genaro, Amarillo, Texas, Private First Class, United States Army – died September 16, 2012, when his unit’s position was attacked with small arms fire in Zabul Province, Afghanistan. He was assigned to 52nd Infantry Regiment, 3rd Stryker Brigade Combat Team, 2nd Infantry Division, Joint Base Lewis – McChord, Washington. The Cemetery flew the Memorial Flag at half-staff in Private First Class Bedoy’s honor on September 28, 2012. Border, Jeremie S., Mesquite, Texas, Staff Sergeant, United States Army – died September 1, 2012, when enemy forces attacked his unit with small arms fire in Batur Village, Afghanistan. He was assigned to 1stBattalion, 1st Special Forces Group (Airborne), Torii Station, Japan. The Cemetery flew the Memorial Flag in Staff Sergeant Border’s honor on September 7, 2012. Stephens, Riley G., Tolar, Texas, Sergeant 1st Class, United States Army – died September 28, 2012, from enemy small arms fire in Wardak, Afghanistan. He was assigned to the 1st Battalion, 3rd Special Forces Group (Airborne), Fort Bragg, North Carolina. The Cemetery flew the Memorial Flag at half-staff in Sergeant 1st Class Stephens honor on October 26, 2012. Memon, Kashif M., Houston, Texas, Staff Sergeant, United States Army – died October 25, 2012, when his unit was attacked by small arms fire in Khas Uruzgan, Oruzgan Province, Afghanistan. He was assigned to the 96th Civil Affairs Battalion (Airborne), 95th Civil Affairs Brigade (Airborne, Fort Bragg, North Carolina. The Cemetery flew the Memorial Flag at half-staff in Staff Sergeant Memon’s honor on November 2, 2012. Nelson, Trent D., Austin, Texas, Staff Sergeant, United States Army – died December 13, 2012, when enemy forces attacked his unit with an improvised explosive device in Kandahar, Afghanistan. He was assigned to the 56th Infantry Brigade Combat Team, 36th Infantry Division, Fort Worth, Texas. The Cemetery flew the Memorial Flag at half-staff in Staff Sergeant Nelson’s honor on December 21, 2012. Mondragon, Enrique, The Colony, Texas, Sergeant, United States Army – died December 24, 2012, when his unit was attacked by small arms fire while on dismounted patrol in Baraki Barak, Afghanistan. He was assigned to Headquarters and Headquarters Detachment, 173rd Special Troops Battalion, 173rd Airborne Brigade Combat Team, Bamberg, Germany. The Cemetery flew the Memorial Flag at half-staff in Sergeant Mondragon’s honor on January 11, 2013. Simpson, Michael H, San Antonio, Texas, Staff Sergeant, United States Army – died of wounds sustained on April 27, 2013 when insurgents attacked his unit with an improvised explosive device. He died at Landstuhl, Germany on May 1, 2013. He was assigned to the 4th Battalion, 1st Special Forces Group (Airborne), Joint Base Lewis-McChord, Washington. The Cemetery flew the Memorial Flag at half-staff in Staff Sergeant Simpson’s honor on May 14, 2013. Cardoza, Kevin, Mercedes, Texas, Specialist, United States Army – died of injuries sustained on May 4, 2013 when the vehicle he was in was attacked by an enemy improvised explosive device in Maiwand, Afghanistan. He was assigned to the 1st Battalion, 36th Infantry, 1st Brigade Combat Team, 1st Armored Division, Fort Bliss, Texas. The Cemetery flew the Memorial Flag at half-staff in Specialist Cardoza’s honor on May 15, 2013. Nunezrodriguez, Joe A., Pasadena, Texas, Staff Sergeant, United States Army – died on May 30, in Wardak Province, Afghanistan, from injuries sustained when his vehicle was struck by an improvised explosive device. He was assigned to the 68th Combat Support Sustainment Battalion, 43rd Sustainment Brigade, 4th Infantry Division, Fort Carson, Colorado. The Cemetery flew the Memorial Flag at half-staff in Staff Sergeant Nunezrodriguez’s honor on June 6, 2013. Reigoux, Job M., Austin, Texas, Staff Sergeant, United States Army – died June 1, in Ghazni Province, Afghanistan, of wounds sustained when insurgents attacked his unit with a rocket propelled grenade. He was assigned to the 3rd Battalion, 69th Armor Regiment, 1st Brigade Combat Team, 3rd Infantry Division, Fort Stewart, Georgia. The Cemetery flew the Memorial Flag at half-staff in Staff Sergeant Reigoux’s honor on June 7, 2013. Raymundo, Mariano M., Houston, Texas, Private First Class, United States Army – died June 1, in Sharan, Afghanistan. The incident in under investigation. He was assigned to the 210th Brigade Support Battalion, 2nd Brigade Combat Team, 10th Mountain Division, Fort Drum, New York. The Cemetery flew the Memorial Flag at half-staff in Private First Class Raymundo’s honor on June 10, 2013. Moody, William R., Burleson, Texas, Specialist, United States Army – died June 18, 2013, when enemy forces attacked his unit in Bagram, Afghanistan. He was assigned to 68th Combat Sustainment Support battalion, 43rd Sustainment Brigade, 4th Infantry Division, Fort Carson, Colorado. The Cemetery flew the Memorial Flag at half-staff on June 24, 2013. Maddox, Anthony R., Port Arthur, Texas, Specialist, United States Army – died July 22, 2013, in Andar, Afghanistan. He was assigned to the 10th Brigade Support Battalion, 1st Brigade Combat Team, 10th Mountain Division, Fort Drum, New York. The Cemetery flew the Memorial Flag at half-staff on August 24, 2013. Grace, Keith E. Jr., Baytown, Texas, Specialist, United States Army – died August 11, 2013, when enemy forces attacked his unit in Paktia Province, Afghanistan. He was assigned to 4th Battalion, 320th Field Artillery Regiment, 4th Brigade Combat Team, 101st Airborne Division, Fort Campbell, Kentucky. The Cemetery flew the Memorial Flag at half-staff on August 25, 2013. Vazquez, Richard L., Seguin, Texas, Staff Sergeant, United States Army – died November 13, 2013, when his unit was attacked with an improvised explosive device while on dismounted patrol in Panjwai, Afghanistan. The Cemetery flew the Memorial Flag at half-staff in Staff Sergeant Vazquez’s honor on December 14, 2013. Viola, Alex A., Keller, Texas, Staff Sergeant, United States Army – died November 17, 2013, when his unit was attacked with an improvised explosive device while on dismounted patrol in Kandahar, Afghanistan. He was assigned to the 3rd Battalion, 7th Special Forces Group (Airborne), Elgin Air Force Base, Florida. The Cemetery flew the Memorial Flag at half in Staff Sergeant Viola’s honor on December 15, 2013. Danyluk, Kerry M. G., Cuero, Texas, Specialist, United States Army – died April 15, 2014, of injuries sustained April 12 when enemy forces attacked his unit in Pul-e-Alam, Logar province, Afghanistan. He was assigned to the 2nd Battalion, 87th Infantry Regiment, 3rd Brigade Combat Team, 10th Mountain Division, Fort Drum, New York. The Cemetery flew the Memorial Flag at half-staff in Specialist Danyluk’s honor on May 10, 2014. Chandler, Christian J., Trenton, Texas, Private First Class, United States Army – died April 28, 2014, when enemy forces attacked his unit with small arms fire in Baraki Barak District, Logar province, Afghanistan. He was assigned to 2nd Battalion, 87th Infantry Regiment, 3rd Brigade Combat Team, 10th Mountain Division (Light), Fort Drum, New York. The Cemetery flew the Memorial Flag in Private First Class Chandler’s honor on May 11, 2014. Spitzer, Thomas Z., New Braunfels, Texas, Sergeant, United States Marine Corps – died June 25, 2014, while conducting combat operation in Helmand province, Afghanistan. He was assigned to 1st Battalion, 7th Marine Regiment, 1st Marine Division, I Marine Expeditionary Force, Twentynine Palms, California. The Cemetery flew the Memorial Flag in Sergeant Spitzer’s honor on July 4, 2014. Hairston, Samuel C., Houston, Texas, Sergeant First Class, United States Army – died August 12, 2014, when his unit was engaged by enemy small-arms fire. He was assigned to the 1st Battalion, 504th Parachute Infantry Regiment, 1st Brigade Combat Team, 82nd Airborne Division, Fort Bragg, North Carolina. The Cemetery flew the Memorial Flag in Sergeant First Class Hairston’s honor on August 14, 2014. Dunbar, Jonathan J., Austin, Texas, Master Sergeant, United States Army - died March 30, 2018 in Manbij, Syria as a result of injuries when an improvised explosive device detonated near his patrol. Dunbar was assigned to Headquarters, U.S. Army Special Operations Command, Ft. Bragg, North Carolina. The Cemetery flew the Memorial Flag in Master Sergeant Dunbar's honor on April 2, 2018.